Thiruvananthapuram • In a Nadigram-style operation minus the violence, Communist Party of India-Marxist (CPM) activists drove out tribal people from Government land atop the Munnar hills today, thwarting their move for a permanent settlement. Tribal families, who had pitched tents on 1,500 acres allotted to Hindustan Newsprint for its captive plantation at Chinnakkanal, were caught unawares as the CPM cadres staged the takeover operation this morning. The activists, backed by local party reinforcements later in the day, tore down tents and put party flags, declaring the success of the operation. Local people said tension prevailed in the area since tribal activists have threatened to recover the land and not to leave until the Government honored its commitment to distribute land to all landless Adivasi families in the State. Tribal families, including children, had occupied the land under the banner of the Adivasi Punaradhivasa Samrakshana Samithy (tribal rehabilitation protection committee). The provocation had come as the fallout of the deal struck between Chief Minister AK Antony and tribal leader C K Janu. At a grand function, Antony distributed title-deeds but only 540 families out of the 798 families got the land. “They had waited for more than five years for the land. The Government had forced them to resort to direct action. They have run out of patience and there’s no question of returning without getting the land”, said tribal solidarity leader C P Shaji. However, the local CPM leaders alleged that Congress and Communist Party of India had instigated the tribal people to occupy Government land so they could grab the land once the dust settled. Tribal agitation has traversed a chequered course in Kerala. Janu had led many families on a 48-day sit-in in front of the Government Secretariat soon after Antony came to power in 2001. The agitation ended with Antony agreeing to a seven-point demand, mainly five acres to each landless tribal family and a rehabilitation package to ensure that the land was not alienated. However, the pact suffered a setback after Janu led a tribal band to the Muthanga wildlife sanctuary in the northern Wynad district two years later, leading to deaths a policeman and a tribal youth. The most important fallout of agitations has been that both the Government and the tribal activists succeeded in shifting the focus of the nearly 50-year-old tribal struggle in Kerala from the issue of “restoration of alienated land” to one of “land for the landless tribal people”. In April 1975, Kerala Assembly unanimously adopted the Kerala Scheduled Tribes (Restriction on Transfer of Lands and Restoration of Alienated Lands) Act, which sought to prevent the lands of the tribal people from falling into the hands of non-tribal people. The Act also sought to restore to the tribal people their previously alienated lands. But that has remained mostly on paper. 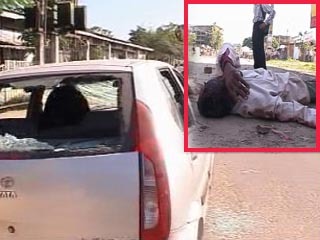 Guwahati: At least five people were killed and over 70 wounded, 30 of them critically, in a mob attack Saturday on tribal protestors in Assam’s main city of Guwahati, officials said. Curfew was imposed in the Bentola area of the city. A police spokesman said the clash took place when about 10,000 tribal people, backed by the All Assam Adivasi Students’ Association (AAASA), took out a protest rally demanding Scheduled Tribe status for the community. BARBARIC: A local resident drags a woman, member of the Assam Tea Tribe Students Association at Beltola Survey, in Guwahati on Saturday. “Local residents of Guwahati and the protestors clashed in the streets after the agitators went on a rampage damaging about 100 vehicles and destroying shops. The angry locals retaliated by attacking the protestors in which five Adivasi people were killed,” senior police official Rajen Singh told IANS. Police fired in the air to disperse the protestors when they tried to break a security cordon to take out the march through the city streets. “Local residents armed with sticks and iron rods, besides crude implements, attacked the fleeing protestors and beat them mercilessly,” said Parag Moni Aditya, a witness. Police and paramilitary troopers have since blocked a major stretch of the city to prevent the protestors from being attacked by the mob. “More than 3,000 locals were involved in the mob attack,” police official A Das said. The injured, including women, were shifted to hospitals. “The condition of at least 30 of the injured is very serious and the casualty figures might mount,” a doctor at the Guwahati Medical College said. The Adivasis are mostly engaged in Assam’s tea plantations and account for about six percent of the state’s 26 million people. Raipur, Nov 5 – About 75,000 impoverished tribals, some armed with bows and arrows, took to the streets in a southern Chhattisgarh city, raising slogans against the state’s special economic zone (SEZ) policy and plans to set up steel units. The rally at Jagdalpur, dubbed as one of the biggest protest marches of tribals in Chhattisgarh, was called by the Akhil Bharatiya Adivasi Mahasabha, an umbrella organisation of tribal groups. ‘Indigenous tribals of Bastar will be driven out from their native lands if the blind industrialisation plan and other schemes of the state government are carried out in the region,’ Manish Kunjam, national president of the Mahasabha, told the gathering amid anti-industry slogans at Jagdalpur, 300 km south of state capital Raipur. Despite heavy police deployment, shopkeepers rolled down their shutters fearing violence during the march. Tata Steel is investing Rs.100 billion to install a five-million tonnes per annum (mtpa) steel unit on 2063.06 hectare land in Bastar. The land acquisition process for it began last week. Essar Steel will bring in Rs.70 billion for a 3.2 mtpa steel plant in Dantewada district and it will require 600 hectares of land for the purpose. ‘Tibals will not hand over their lands for steel units and will oppose authorities’ forced land acquisition. We will not allow industry majors to set up plants in Chhattisgarh at the cost of mass displacement of tribals,’ Kunjam told the protesters’ gathering. Rally participants sought early rehabilitation of about 50,000 people of Bastar region displaced due to a fallout of the anti-Maoist civil militia movement, Salwa Judum, launched in June 2005, and 50,000 other people who were allegedly forced to flee their villages and are living as refugees in neighbouring Andhra Pradesh due to authorities’ ‘excesses’. "Jail-Bharo" on 2nd October by the Indigenous People…. Delhi Contact: Q-1 Hauz Khas Enclave, New Delhi 110 016. Ph: 9968293978, 26569023. On October 2nd , Gandhi Jayanthi, in response to a national call of the Campaign for Survival and Dignity, mass organisations of tribals and forest dwellers will court arrest across the country. Enough is Enough! No More Attacks on Our People, Destruction of Our Homelands and Sabotage of Our Rights! Across India, forest areas are in flames. Evictions in Rajasthan continue and fields are seized for biodiesel plantations. The Chattisgarh government deploys a state sponsored militia (‘Salwa Judum’) which commits inhuman atrocities to “cleanse” the forests of people. Armed police in Orissa continue their standoff with villagers fighting eviction by Posco. Even the victories that are won are sabotaged by the government. The Forest Rights Act, the biggest step forward in the history of India’s forest communities, was passed last December. But at the last moment key parts of the Act were undermined, and the government has tried to do the same in the Rules. In the meantime thousands of families have been evicted and their houses destroyed because of the continued failure of the UPA government to notify the Act into force, showing just how serious this government actually is. Recognise all genuine forest dependent people and Exclude Contractors, Traders, and Exploiters Stop the militarisation and seizure of our lands Recognise our rights to collect and transport minor forest produce Halt arbitrary resettlement in the name of wildlife conservation Make the recognition of rights legally clear – our rights should not be taken away by legal manipulation Jangalvasiyon Ko Swaraj Do! Empower our communities to defend and protect the forests against mafias, the government and companies Ensure the authority and effectiveness of the real gram sabhas of our communities in determining rights Bring all adivasi areas under the Vth Schedule of the Constitution and remove hurdles in implementing the Panchayats (Extension to Scheduled Areas) Act, 1996, which gives us the power to safeguard our resources. Jail Bharo will take place at the district headquarters of Dungarpur, Banswada, Bara, Bhilwada, Alwar, Sirohi and Chittorgarh districts. In several of these districts andolan will take place at the block level as well. Jail Bharo will take place at district level in several districts, details of which will be announced shortly. Large protest and jail bharo will take place at Bhubaneshwar. Jangal Jeevan Adhikar Bachao Andolan, a joint forum consisting of the Madhya Pradesh Jangal Jeevan Surakhya Abhiyan, Adivasi Sangram Parishad, Akhil Bharatiya Adivasi Mahasabha (CPI), Rashtriya Yuva Sanghatan, Kisan Sangharsh Morcha (Samajwadi Jan Parishad), Gondwana Mahasabha, Gondwana Mukti Sena, and Gondwana Adhikari Karmachari Sangh, will take out rallies and morchas in all districts of the State from October 1st to October 10th . A mass jail bharo will be held in Bhopal thereafter. Large protests will take place in several district headquarters across the State on October 2nd . Details will be conveyed shortly. Jail bharo andolan will take place in the district headquarters of Ranchi, Jamshedpur, Palamu, Latehar and Gumla districts. Protests will take place across the State on October 2nd and for the rest of the month. Large protests will take place in Nilgiris, Kanyakumari, Tirunelveli and other districts. Bharat Jan Andolan, National Front for Tribal Self Rule, Shoshit Jan Andolan (Mah), Adivasi Mahasabha (Guj), Adivasi Jangal Janjeevan Andolan (D&NH), Jangal Jameen Jan Andolan (Raj), Madhya Pradesh Van Adhikar Manch (MP), Jan Sangarsh Samiti(Chat) , Peoples Alliance for Livelihood Rights, Orissa Jan Sangharsh Morcha, Campaign for Survival & Dignity (Ori), Orissa Adivasi Manch, Adivasi Aikya Vedike (AP), Andhra Pradesh Vyavasaya Vrithidharula Union, Campaign for Survival and Dignity – Tamil Nadu, Bharat Jan Andolan (Jhar).